Bargain Alert! Take advantage of the huge savings available now. 7 hours, 58 minutes left! Where do I use my Discount London voucher code? "Up to 50% off selected tours." Established in 1992, Discount London thrive on offering cheap sightseeing deals exclusive to London's attractions. Discount London offer a low price guarantee on tickets to all the top London attractions whether it be London Eye experiences, open top bus tours, theatre shows or days to London Zoo and Madame Tussaud's. With daily price checks and hundreds of things to choose from you are assured to find your tickets at a discounted price. 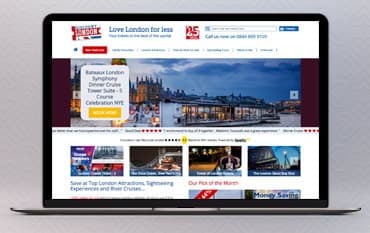 Browse today and be sure to use Discount London for all your sight-seeing and activity-filled ventures! Discount London does exactly what it says on the tin. With plenty of money saving deals and incredible discounts on offer for attractions and activities across London. You can find amazing deals like 2 for 1 London as well as discounted prices on bus tours, Tower of London and London Eye experiences as well as London Zoo and Madame Tussauds tickets. Discount London carries out daily price checks so you can be assured to find the cheapest price available. And, with hundreds of experiences to choose from you can be sure that you’ll find a discounted price for whichever attraction you’re going to. With Discount London, Enjoy instant access to the biggest tickets and packages of London Sightseeing and walking tours, including the famous original open top bus tours! A sightseeing icon in its own right, step on board a double-decker bus for the must-do tour of London’s world-famous landmarks. This is a great way to see London's biggest and best attractions from a different point of view, aboard a double-decker bus of course! The Original Open Top Bus Tour provides the classic London sightseeing experience, with a bundle of extras to boot. Hop on/Hop off all day long while listening to laugh a minute commentary and keep the kids busy with an activity pack – They will even throw in a Free Cruise on the River Thames with your booking. Sightseeing doesn't get more fun than this, and what's more, with a Promo Code added onto your order courtesy of our Discount London Deals page over at NetVoucherCodes, you can make even bigger savings off your next booking! How are my tickets sent? Your e-tickets are sent via email. These must be printed out and taken with you on the date of travel. Yes. Your booking can be changed, subject to the package which you have booked. Please not: there may be a admin fee subject to each change and Discount London need at least 72 hours notice. If you decide to cancel your booking and qualify for a refund, the agreed amount will be issued back to the card purchased with. The refund may take 5-7 working days to process, depending on your bank. Discount London brings together all the greatest deals on entertainment, dining, activities, experiences and more that London has to offer into one convenient package, so you can explore and choose the fun that's perfect for you. Each one of Discount London's suppliers and services are specially selected to ensure that you get the very best; they take great pride in ensuring that all of their services are of the very highest quality, safe and excellent value for money. If you're planning your next trip to the UK's capital, be sure to check out the wide array of package deals on all things fun at Discount London and don't forget to add a Promotional Code courtesy of us onto your order at the checkout for extra savings on your next purchase.